Compared with this tangle, the theology of Xipitotec, the Flayed God, is relatively simple. Tough messages, these Christian doctrines, and in some parts of Mexico the friars are still struggling to sell them. The inside of the Church and ex-Monastery of San Pablo and San Pedro is plain, but there are a couple of nice Baroque lateral altars. There is a colonial era painting of the Trinity too, on a wall between a couple of modern plastic saints on pedestals: the Father looking stern, the adult Son sitting rigidly on his lap as if Papa were an uncomfortable chair, the Holy Spirit as a dove perched on the Son’s head just under the Father’s chin, all three of them with triangular halos. I wonder if paintings if like these made the Dominicans’ task easier. The Zapotecs had bird gods too, fierce eagles representing the power of the spirits in the air. To the Indians doves were not symbols of peace: doves came in flocks and destroyed crops, and their only virtue was that they ate bugs and were themselves delicious eating. 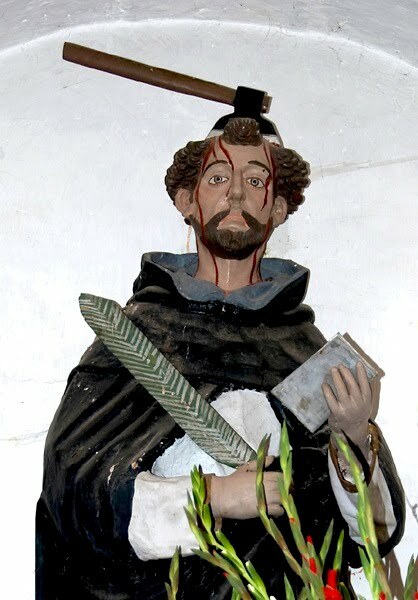 We tiptoe to the other side of the cloister to hear them better and, under the placid gaze of San Antonio Martyr, I jot down the words. Just last week, in Cincinnati, I talked at the Skirball Museum about the fellow at Rabbi Amram ben Diwan’s tomb in Asjen, in Morocco, his cellphone pressed to his ear, tossing candles into the holy man’s bonfire and relaying, in a loud voice in French and Hebrew, the prayers of his brother in Paris. Daughters Abby and Deborah are Oaxaca veterans. In fact, they’ve been coming to Mexico with us and with their mother Libby since they were barely old enough to squeak out “Una paleta de limón, por favor” (a lemon popsicle, please) to the ice-cream man pushing his cart through the plaza in Papantla. Though Matt, Abby’s partner, has traveled over much of the world, it was with the navy, and most of his foreign experience has been with longshoremen. He has never been to Mexico and does not yet speak Spanish. He is a quiet guy, undemonstrative but inquisitive, and he has eyes like an eagle. The girls, one living in Indiana, one in Oregon, see each other seldom, and when they get together they jabber incessantly. On sightseeing trips we don’t need much gas: their energy powers the car. Matt sits quietly between them in the back seat, head swiveling from side to side, missing nothing. Among us, for Matt’s week in Oaxaca we have sketched out a little-of-everything tour: old buildings and new, high mountains and valley floor, Oaxaca City’s bustle and the quiet of the thorn-clad countryside, market food and top-of-the-line restaurants, museums and churches, shopping and zócalo sitting, early morning birding and late evening Netflix episodes of Farscape. Deborah —thanks to Xipitotec or Saint Jude or good doctoring or time— is no longer reliant on her wheelchair, but her feet still do tire out. We have borrowed Bill Stitcher’s plastic stool, and wherever we wander, one of us totes it along. The five us tread slowly through the sunny patches —we’re slipping into the hot season now— and take rest breaks in the shade. Monday morning, at San José Mogote, the oldest city site in the Valleys of Oaxaca, Deborah, escorted by Abby and stool, makes it to the top of the tallest pyramid, and we all cheer. In the Municipio, the town hall of Suchiquiltongo, the village at the foot of San José Mogote, the site museum is actually open. Every other time I’ve been to the village it was a weekend. The docent/guide/guard, Victoriano Vázquez, welcomes us with a smile and a basket of butterscotch candies. We sign the guest register below the last visitor, a man from Puebla, who inscribed the book one month and two days before us. Victoriano accompanies us from case to case, commenting on the finds and on the site’s history. He is enthusiastic, expanisive, very informative, and sorry that he cannot let us take pictures. I can’t help wondering how he has filled his days between our group and the man from Puebla. The quality of the Mogote artifacts is astounding: A deeply incised urn, the size of a large beer barrel, the glyphs and floral backgrounds so intricately intertwined that at first glance the art seems to be abstract rather than representative. A stone globe, the size of a basketball (“The archaeologists thought it was ceramic, and weren’t they surprised when they found they couldn’t lift it!”). The top third is painted red, the bottom two thirds black. The world of blood and flesh and the dark of death? The heavens and the earth? Victoriano believes the globe is unique in Mesoamerica. Prize of prizes is the tomb just below the tallest pyramid and reconstructed here. Ingenious architecture, glyphs, steles, mural paintings of processions and ball players and gods. All this stuff was supposed to go the National Archaeological Museum in Mexico City, but the citizens of Suchiquiltongo revolted and, as legend has it, stood off the INAH (Instituto Nacional the Arqueología e Historia) movers with hoes and machetes. Wednesday we all but Linda pile into Bill Stitcher’s car and work our way up the Guacamaya road to the village at the top of the central chain of mountains, too high, the doctors say, for Linda’s lungs. We are four birders and one tolerant Matt. The road is dirt but in good shape, and we ride with the windows down, our ears scanning for birdcalls. When we spot an advancing dust plume we sprint to the next layby, roll up the windows, and wait until the vehicle has passed and the dust settles. Though the scenery is gorgeous, birding is thin: in the last two weeks many of the most attractive migrants have begun their long journeys north. We stop at the ford (about 7200 feet) where a trail leads into the river gorge. We fan out along the trail and scan the brush and treetops for the red-collared tanager, a rare bird that Bill and I think we glimpsed a month ago. We’re hoping to photograph it to prove its presence in the Etla region. But there are no tanagers, and basically no anything. The river is running brown: heavy rain or construction upstream. At the lagoon (±8000 feet) we log a streak-faced wood-creeper, a first bird for all of us but Bill. The lagoon is maintained by San Gabriel Etla, a village of at the foot of the mountain, and a work crew is repairing a suspension bridge. The town has built a small restaurant, a zip line, and a wheelchair accessible path around the small lagoon. On the veranda of the rustic restaurant three of us sip cafe de olla (coffee with cinnamon) while two down mugs of chocolate, and all five of us listen to a pair of least grebes chattering to their chicks in the shallows. We aren’t really thirsty or hungry, but it has become an ex-pat custom to always patronize these village efforts to maintain the mountains as an economically viable natural reserve. The village of Guacamaya (±8950 feet), at a notch that collects a lot of moisture in the high peak region, raises fruit and cut flowers for the markets in Oaxaca City and, as a result, is a bit of a birder’s paradise. We stroll main street—well, the only street—peering down into the orchards and flowerbeds. In the next hour Deborah and Abby (and the non-birder, Matt) see a dozen species that are new to them, and Bill and I renew acquaintances with old avian friends. Four eight-year-olds, swathed in sweaters and scarves against the spring chill shadow us. They are pretending to do errands, then pretending to play basketball in the plaza by the school, then to return home to do something important for their mothers, all the time calling to each other in voices meant to be overheard. We must be more exciting than a circus. As we prepare to leave, Matt trots further up the road, pulls a device out of his pocket, looks at it, turns around and walks another twenty steps, turns again and grins: “9000 feet!” Higher than anything in Indiana, that’s for sure. Just below the village is a set of cabins for overnight visitors and another small restaurant, Guacamaya’s attempt to derive a little more income from their mountain paradise. The restaurant’s dining area is dark: the low ceiling and small windows protect against the temperatures that fall once the sun goes down. But outside is a small roofed platform on stilts, with a table and five chairs: a perfect place for lunch. We order trout, the restaurant’s specialty. There is a small trout farm a few hundred yards from here, fed by the stream in the arroyo. Trout lightly fried in garlic, with a salad of fresh greens and black beans and slices of onion and avocado. Trout steamed in aluminum foil, coated with onions and local herbs and Oaxaca cheese. Beer and soft drinks and a pitcher of jamaica (hibiscus-water). Delicious and almost more than we can eat, about $35 for the five of us. And so goes the week. Barbecued goat and tlayudas on the way back from the Tulancingo Sunday market. On the return from the paper factory in San Agustín, an eighty-course buffet in a park whose centerpiece is a DC3, veteran of the Burma Road airlift. Flavored ices (prickly pear, mezcal, burnt milk, and Oaxacan Kiss) in Tule after circumambulating the world’s most massive tree. Bowls of steaming chocolate on Calle Mina in Oaxaca. More flavored ices (lemon, mango, grasshopper and tamarind – really, I’m not making this up) outside of Monte Alban. And even a few minutes to catch our breaths in a beanfield, overlooking the vastness of the Etla Valley, mountain chains on both sides of us, and the trickle of irrigation water in a canal behind us tickling our ears. For me and Linda the best part, of course, all week, is the company of the family.